Shelves are a great way of creating extra storage space without having the bulk of a full piece of furniture. Lozi can create a bespoke one of a kind wall mounted shelving system exactly tailored to your needs. Whether in the kitchen, living room or bedroom, we can create something practical and elegant perfectly tailored to your personal space. As seen in The Sunday Times! Open plan shelving above kitchen units creates storage space without enclosing the room. Ideal if your kitchen isn't particularly big to start off with. Cass' s home is a perfect example. By creating a clean but complex shelf, Lozi has given her plenty of space to store and display kitchen utensils without stopping the flow of light. Vicky’s simple and clean shelves peek elegantly out from the bedroom alcoves. Designed to fit daily items like beauty products and jewellery, they create just the right amount of extra space without cluttering the room. Stephen wanted a combination of open plan bespoke shelving to display books and favourite objects as well as a floating sideboard to hide the less attractive items. Lozi specifically designed this shelving with space for his boxing gloves. Georgina wanted a bespoke display system for her myriad of colourful boxes, so Lozi created these elegant shelving sets with curved details. A pair were installed in her kitchen and another pair in her bedroom, bringing the style in her whole flat together. Who said small couldn't be beautiful! Alban wanted to make the most of his living room by combining a work from home area with ample space to relax in and plenty of storage for his library and art collection. By creating a single long shelf that runs parralel to the ceiling, Lozi makes the most of a small space. Under seat storage provides extra room and a desk that fits into the seating space ensures no inch goes unused. 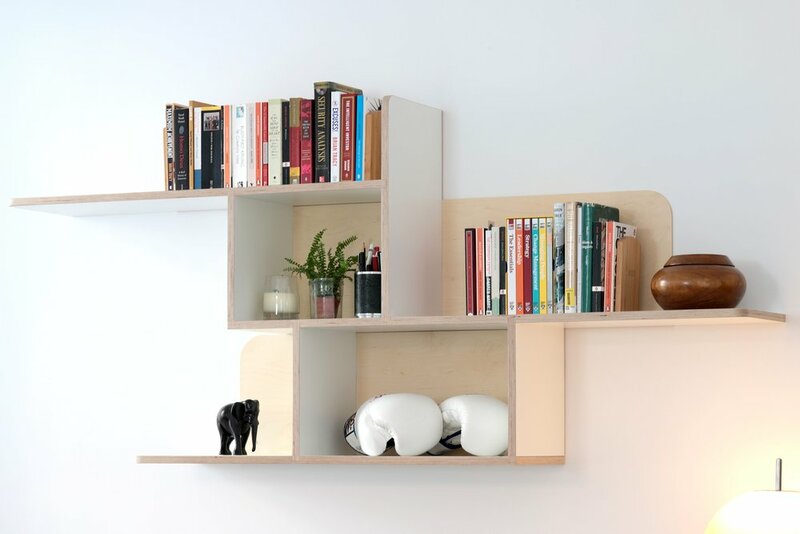 And of course our Smile Shelves and U Shelves from our standard collection are customisable to suit your home. A set of medium size U shelves in Georgina's Richmond kitchen, painted a bespoke grey and with extra high sides. Smile and U shelves in custom colours. A set of U Shelves (one medium and two large) painted a bespoke grey in Anna & Kirsty's Brighton Kitchen.